As the functionality grows in a large GWT application, developers tend to add more split points (calls to GWT.runAsync), to ensure that the size of the initial fragment is as small as possible. Keeping the initial fragment small ensures that application starts as quickly as possible. However, adding more split points also increases the likelihood that two fragments share common code. 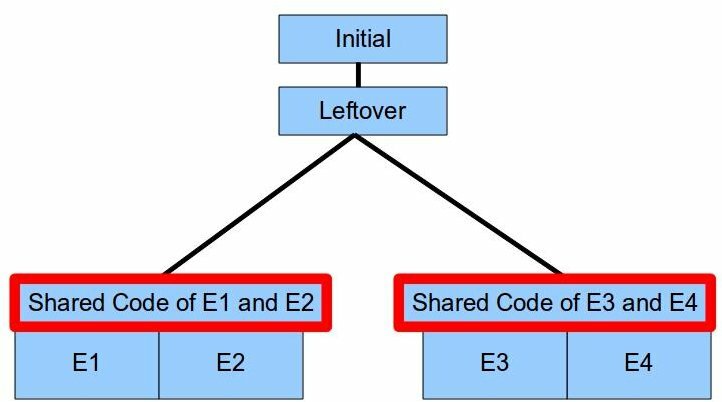 As shown in this diagram, the GWT compiler creates an exclusive fragment for each split point and adds any shared code to the leftovers fragment. The result is that the project’s leftovers fragment gradually gets bigger as developers add more split points. While this has no effect in the initial loading time of the project, the latency of the first requested split point usually suffers. New to GWT 2.5 is fragment merging. We gave the code splitter the ability to automatically merge multiple exclusive fragments into a single fragment. 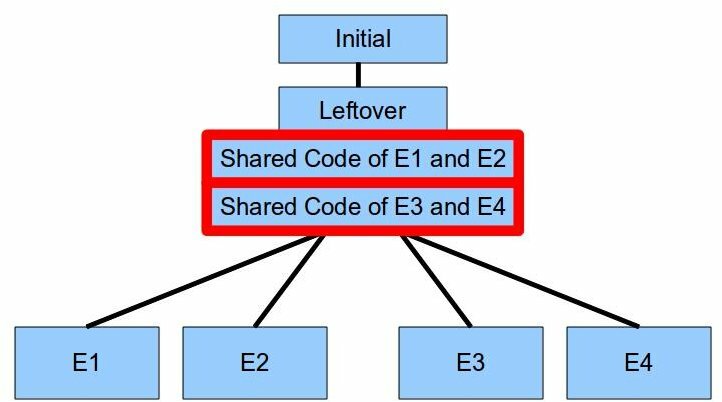 This diagram shows the situation after the compiler realized that E1 and E2 share enough code and automatically bundled those two split points into a single fragment, effectively pulling the shared code out of the leftovers fragment. When the application needs either E1 or E2, it downloads the whole bundle. Not only does this decrease the leftovers fragment’s size, it also decreases the total number of HTTP requests in a user session, assuming that many fragments will eventually be needed. To enable this feature, simply add -XfragmentCount x to the GWT compiler command line and the code splitter will try to limit the number of exclusive fragments to x. Here, x is the lower bound on the number of exclusive fragments. The actual number might be greater than x when the compiler decides it might not be beneficial to merge as many split points as suggested.